Sailingdipity: "Sit on a Jury"
As a teenager I created a dream list. A list of things that I wanted to do in life. One of the items on that list was "Sit on a jury". I'm not sure why this was on my list, but it is something that not everyone gets to do. As we get into adulthood and receive that summons to appear for jury selection we often get frustrated with the burden. With the responsibilities of adulthood, marriage, family, school etc. ,it becomes something that we don't have the desire to make time for. In September when I got that letter informing I had to report to court for jury duty, I had mixed feeling. The period for which I was called was 3 months. Oct. through Dec. If you ask me that is a very long time. We were asked to fill out a questionnaire, answering some simple questions about our background, we attended orientation and then were instructed to call the jury line to be informed weekly if we needed to appear for jury selection. On an island, I am sure it is hard to find able jurors that don't know someone associated with the case, so I had determined I would probably be selected often. So far, out of 6 cases I have been selected for 2. The first case, we were dismissed early and we were unable to deliberate, however my second case, we just completed and I could not pass up the opportunity to blog about the experience. Sitting on a jury was a nice break from the everyday work routine. Though we didn't have access to media or our cell phones, and we were asked to sit in a room full of strangers for an unpredictable amount of time, it was something new. The first day of trial didn't have much of an impact on me. I stayed alert, listened and followed my instructions, keeping an open mind and doing my best to be a fair juror. On breaks and recesses, we were asked not to discuss the case with anyone. Because of this we were all able to get to know each other a little better, we were laughing and arguing together all day. When we were excused for the day and asked to return for a second day none of us were surprised, but some were frustrated the courts were taking away another beach day for them. I wasn't frustrated because I knew that this was an important process. It was something that no one really liked to do, however someone had to be able to sit on that jury and give the accused that chance to plead their case. I felt frustrated by my other jurors who were selfishly thinking they had more important things to attend to. In my mind, we had a gentleman's life in our hands, we were there to make sure that the justice system was fair either proving him guilty or not guilty. The second day was unpredictable, we didn't know whose voice we were going to hear, we didn't know how long it would take. This second day really had an impact on me. We were able to hear from the defendant. The person who was accused of this crime. As he sat on the stand and spoke to us, answering or not answering the questions from counsel we were able to hear his voice not just his lawyers. 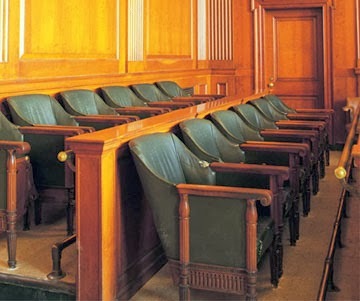 Something very important that a juror has to keep in mind, is that it is very important to not make decisions based on sympathy. As the defendant spoke, I felt sympathy, I think we all did, and I am sure that was a slight tactic from the defense. The sympathy we felt was something we had to ignore. We had to look only at the facts and the evidence provided to us. So even though the sympathy was presented to us, making us see the defendant more as a person, and not just a crime, we had to be very careful with our judgement. As each side rested their case, I was thankful for the judges role. The judge informed us again of our duty, the law and the rules of a juror as he did at the beginning of the trial. He informed us that we must make a decision based only on evidence that was presented in court, we were asked to be fair and impartial. We were asked to take this seriously. We were asked to do our best and come to a unanimous decision. As we deliberated, the time went by fast. We were focused, we knew what we needed to discuss. We were all able to state our opinion, we saw how different things are interpreted different by different people, we saw the whole process of trial by jury come to a final decision. We took our time, we knew we had made our decision. I was anxious as we walked back into the courtroom, I was anxious to see the defendants face, the counsels faces, and I was thankful to have been able to be a part of this system. As our foreperson read that we find the defendant not guilty, I just watched. I watched the facial expressions, I was relieved the process was complete. I then witnessed the defendant sit down a chair and break down crying. We were excused from the courtroom, and as we walked back to the deliberations room, many of us shed tears. I couldn't stop the tears from coming, but I knew when I started to cry that they were tears of relief. I was certain we made the right decision,and the tears came by being overwhelmed with relief. Now I know why I had "sit on a jury" on my dream list. This is an experience that was humbling, enlightening, and fulfilling. I felt empowered, I felt like I was able to truly be fair and impartial in every aspect. There is so much going on in this world. Everyone needs to be aware of their surroundings, the people they associate with and learn right from wrong. I believe this gentlemen got a second chance, and I hope that he finds a life away from the projects, and away from people that will bring him down. During the whole process I was wishing that my fellow jurors would look at the big picture. I wanted them to look at the trial by jury process and know that at any point it could be any of us fighting for justice. We could be fighting for justice for ourselves, family or friends who may have been a victim or the accused. I was able to see the flaws in the system. I was able find a greater respect for everyone around me. I gained respect for prosecutors, defense attorneys, fellow jurors, and judges. This process is not easy. I know now that I am thankful for this experience, and I see the burden it has on people, not only because it doesn't fit into their schedule, it is a great responsibility that is very stressful. I am thankful that I didn't feel the stress, but stayed focused. Those tears of relief were the one thing that made me realize what a stressful and meaningful experience this was.